The Giant Leaf Insect is a large species of leaf insect with the scientific name Phyllium giganteum. 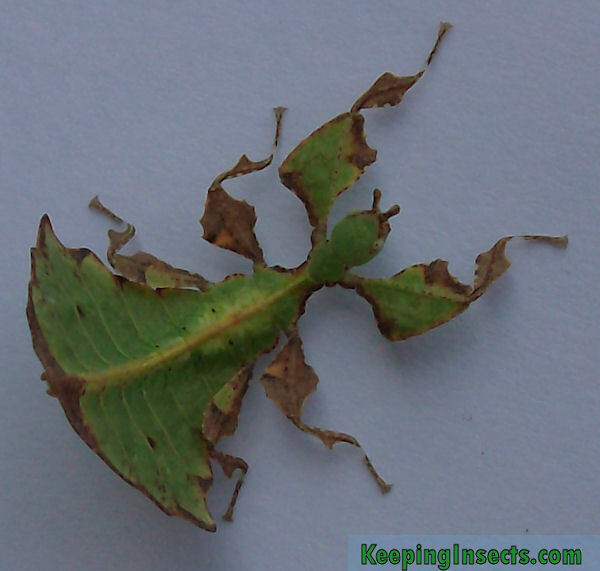 Leaf Insects are insects in the order of stick insects (Phasmatodea) that look like a leaf. 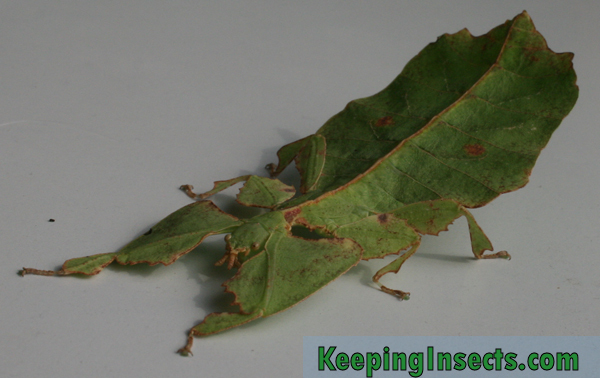 Phyllium giganteum is one of the largest species of leaf insects that is kept as a pet. Phyllium giganteum is referred to as PSG 72. In nature it can be found in tropical forest in Malaysia. This species consists of only females. Two dead museum specimens of Phyllium giganteum males have been found, but as these have never been seen alive or tested for reproductive capabilities it remains unclear what role males in natural populations of this species have. Females will lay unfertilized eggs, that will give rise to new females. In captivity there are no males. 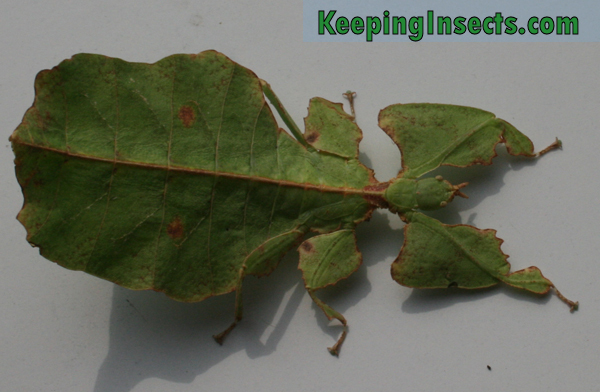 Phyllium giganteum is a very wide and large leaf insect with a body shaped like a leaf. Also the legs have appendages making it look like leaves. The skin is green in color with brown spots around the edges. Two brown dots decorate the top of the abdomen. The shade of green and the amount of brown edges and spots differs between individuals. Females will become around 10 cm in lenght. Phyllium giganteum female nymph, you can see how flat her body is. 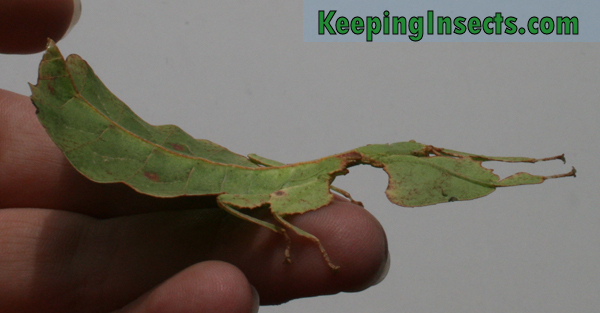 Phyllium giganteum is a very docile species, like many stick insects and leaf insects. During the day it sits very still, during the night it will move and eat. The newborn nymphs are a bit hyperactive, however after their first molt they will remain very quiet. When you pick up a Phyllium giganteum female, it will generally just stay still to keep up the appearance that it is a leaf. It is hard to coax them into moving. Subsubadult Phyllium giganteum female. She will get much larger than this. Giant Leaf Insects eat leaves of bramble, oak and rose species. Do not feed the fresh new leaves, especially not of bramble. The older, darker colored leaves are much better. Young nymphs cannot eat from undamaged leaves, so you should cut of the edges of the leaves before you feed it to them. How to place foodplants in a stick insects cage can be read here. The temperature of the cage for Phyllium giganteum should be between 25 °C and 30 °C. This species needs a lot of humidity, but also a lot of ventilation. Nymphs need to be kept more humid than the adults. Do not allow mold to form. It can be challenging to keep this species healthy. As with all species of stick insects, Phyllium giganteum needs a cage that is at least 3 times the length of the insect in height, and at least 2x the length of the insect in width. For one adult female this means at least 30 cm high and 20 cm wide, but better is around 40 x 30 x 30 cm. Bigger is always better. You cannot house stick insects and Giant Leaf Insects together in one cage, as the stick insects will eat the body of the leaf insects when food is scarce. 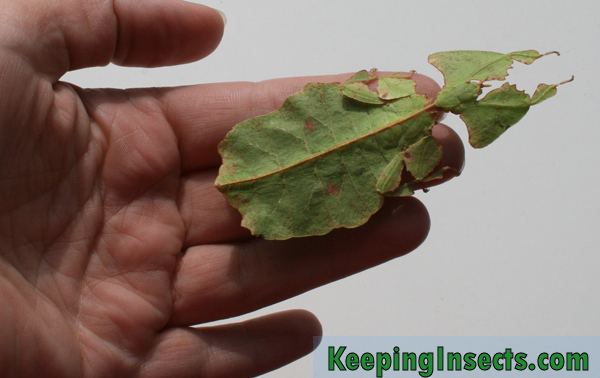 Adult female Giant Leaf Insects will start to produce eggs around 1 to 1,5 month after becoming adult. You can see it has reached adulthood by the big wings on their back. Only adult females have these wings. The eggs are small and black in shape and can be easily distinguished from droppings. The eggs are just dropped to the floor of the cage. Collect the eggs and keep them on moist paper. Make sure no mold forms on the eggs or the paper, because this will kill the eggs. A good method to avoid mold is to let the paper dry up in between misting it with water. Keep the eggs at 25 to 30 degrees Celsius. The eggs will hatch after 6 to 9 months.